Preheat oven to 350°F. Mix bread crumbs, 2 tablespoons of the Parmesan cheese, 2 tablespoons melted butter and 1/2 teaspoon of the Italian seasoning in small bowl. Set aside. 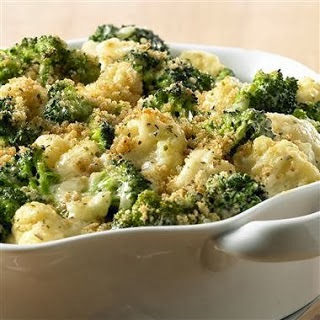 Cut up any large broccoli or cauliflower florets into bite-size pieces. Melt 2 tablespoons butter in large skillet on medium heat. Add onion; cook and stir about 5 minutes or until tender. Stir in flour, remaining 1 teaspoon Italian seasoning, garlic salt and pepper. Add milk; cook and stir until thickened and bubbly. Add cream cheese and remaining 1/4 cup Parmesan cheese; cook and stir until cream cheese is melted. Add vegetables; toss gently to coat. Spoon into 2-quart baking dish. Sprinkle top evenly with crumb mixture. Make Ahead: Unbaked casserole may be prepared 1 day ahead. Cover and refrigerate. Bake as directed.